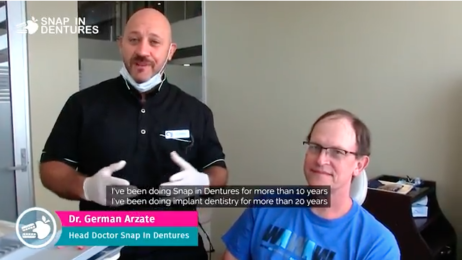 Snap in Dentures: A life changing experience. Our work is always full of stories. Each patient is different and sometimes there are stories about pain, shame, low self-esteem and it’s the best feeling in the world when our patients step out of our office feeling good about themselves, recovering their lives, letting themselves being happy and also, recovering their health. This is the story of Brian, a patient that came from Rockford, Illinois after having a lifetime of having spent thousands of dollars, time lost and suffering pain he decided to give himself the chance to come to Cancun and see us. He got Snap in Dentures upper and lowers with 8 mini dental implants and it’s working beautifully! The plus in this story is that he spent much less of what he was thinking. By coming to Cancun you can save up to 70% of the price in USA or Canada. Now you can see Brian enjoying life again, smiling without hesitation, eating all that he wants and recovering also his health and self-esteem. Thank you Brian for your trust and for being an amazing patient! Learn more about Snap in Dentures in this article! If you need more information please, call toll free or leave a message!